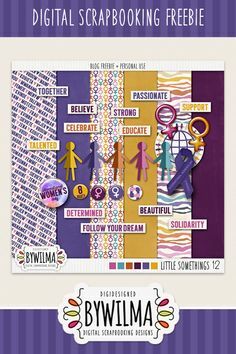 Thank you for your purchase and/or download of my “digidesigned byWilma” products. For questions, concerns, and to share your work with me, please contact me. Copyright of all the graphic images created digidesigned byWilma/Wilma Kaufman are retained by Wilma Kaufman. All graphic images are copyrighted with all rights reserved. YOU MAY use my designs for your own scrapbook pages and projects, including hybrid works or paper scrapping. 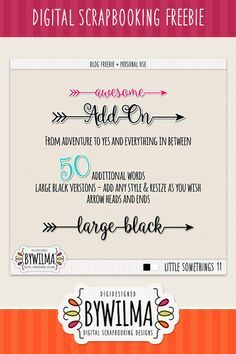 YOU MAY alter these images to fit your scrapbooking needs, including resizing, recoloring and cropping. YOU MAY use my designs in layouts that are posted in online galleries and/or submitted to magazines. Please be sure to credit digidesigned byWilma with the element and/or kit name. If you would like to link to a website, please use the following link address: www.digidesignedbywilma.com. YOU MAY copy my files to any external hard drives and computers that are owned and used expressly by you for digital scrapbooking purposes, this does not include computers that are used by other digital scrappers or people who would use MY designs other than your immediate family (spouse, children living in the same household). YOU MAY make DVD or CD backups of my files to store solely for your own use. These backups may not be shared with any other person. YOU MAY request my permission to use my designs in any type of project not specifically permitted by these terms. Please send your inquiries using the contact page on www.digidesignedbywilma.com, send me an email or contact me via an Etsy conversation. YOU MAY NOT claim these images as your own (altered or unaltered), redistribute my designs in any way (selling, sharing, loaning or pirating), create brushes or tubes from my designs. YOU MAY NOT offer these items in any other graphics collection, on a website, or individually, either for sale or free, create a competing product from them to sell or redistribute, and are not allowed to trade or share this product. You may not add to or distort, alter or recolor any graphic and claim them as your own. You may not make any graphics into tubes or brushes and redistribute them in any way. You may not use these designs for any marketing purposes. You may not use these images for obscene, defamatory, or immoral works, or for any purpose that is prohibited by law. YOU MAY may use my designs for your small, home-based business as under my limited professional use/scrap for hire conditions, noted below. YOU MAY create custom, one-of-a-kind layouts or other craft items for individual clients to be delivered to the client in printed or flattened .jpg form without asking permission or purchasing an additional license. The product/license you purchase is valid for one individual customer only. YOU MAY NOT use my designs in your own designs for sale (in digital scrapbooking terms: this product is not for CU). YOU MAY NOT use my designs to start a web-based scrap for hire, graphic design, invitation, web/blog design, commercial blog, Etsy store or any other internet business. YOU MAY NOT use my designs to create pre-made pages or templates for sale at any online store, blog, or auction sites. This includes (but is not limited to) quick pages, blog templates, and premade cards/invites/announcements. My products may only be used to create original, unique designs that are created as a one-off custom design for one customer. Please note: simply changing a customer’s name and event info on an existing design is NOT a custom, one of a kind design. You must repurchase the product/limited professional license for every single project. YOU MAY NOT use my items for the purpose of web design or web templates without permission. This includes, but is not limited to, eBay product pages or eBay about me pages, Etsy storefronts, My Space Layouts, WordPress themes, Blogger templates and the like. 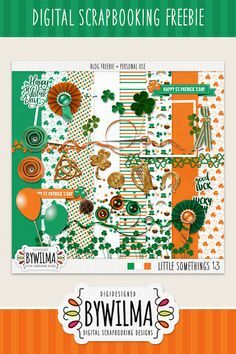 If you are interested in this type of use either commercially as a web designer or personally for your own blog, please contact me through www.digidesignedbywilma.com, send me an email or contact me via an Etsy conversation. to discuss the proper licensing and/or request permission. YOU MAY NOT create freebies or any other give-aways with my products. YOU MAY NOT use my designs for any harmful, pornographic, obscene, defamatory, immoral or racial material. YOU MAY NOT upload my designs to any webpage for download, send them through Google, Yahoo or other similar groups, or share/redistribute/sell them in any way, shape or form. I currently do not offer a Commercial Use/Professional Use licence for my products but only a Personal Use or Limited Professional Use/Scrap for Hire/Scrap for Others. This means my products cannot be used in the creation of items such as (digital/paper) scrapbooking kits, cards for sale, templates, web templates, blog design, etc. (these are examples, but prohibited use is not limited to these examples).